Pep Guardiola has defended Raheem Sterling following the controversial penalty awarded against Shakhtar Donetsk in the Champions League on Wednesday. 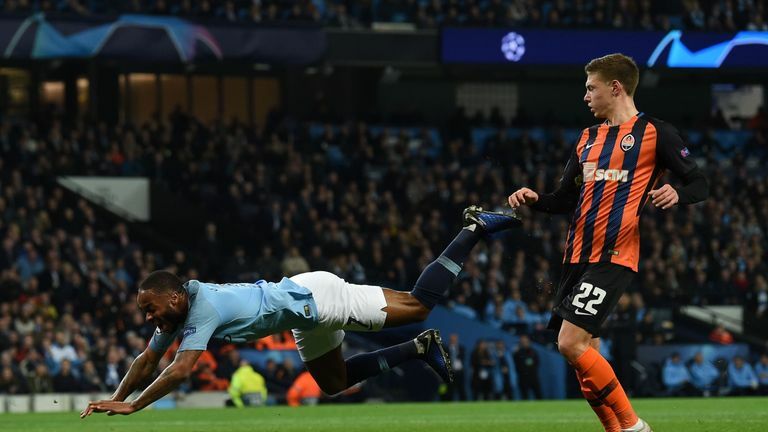 The England winger - who signed a new long-term contract with the club on Friday - appeared to catch his studs in the turf during City's 6-0 thrashing of Shaktar at the Etihad only for referee Viktor Kassai to award a penalty to City midway through the first half. Gabriel Jesus slotted home the spot-kick - the opening goal in a first senior hat-trick for the Brazil international - with Sterling subsequently receiving criticism in some quarters. Guardiola believes that is unfair, however, and insists Sterling is becoming stronger as a player and an individual. "It is unfair, I don't know why they should criticise Raheem. It was not diving. He tripped, it was a mistake," Guardiola said of the decision ahead of Sunday's derby with rivals Manchester United, live on Sky Sports. "It was a bad decision by the referee, he didn't do that [dive]. "He's an incredibly nice guy, he has an incredible love for the locker room. He does absolutely everything on the pitch, every single game, 90 minutes. "He made a mistake because he is 23 years old. He maybe goes so fast, so quickly, that the trip, he needs to do it slower. "The comments people said about this action, I did not understand. Sometimes diving, sometimes making a bad decision. Everybody can do that. "It will make him stronger. He is stronger than when we met each other in the first year. "Now he controls these kind of emotions much, much better. When you are 23 years old you are not a full person, or a full player. "Sometimes we demand a lot from our players when still they are so young."